may 24 — Johnny, Joep, Get and I drove over to 8 C.G.H. at St. Michels Castle and attended Marg Lates reception. 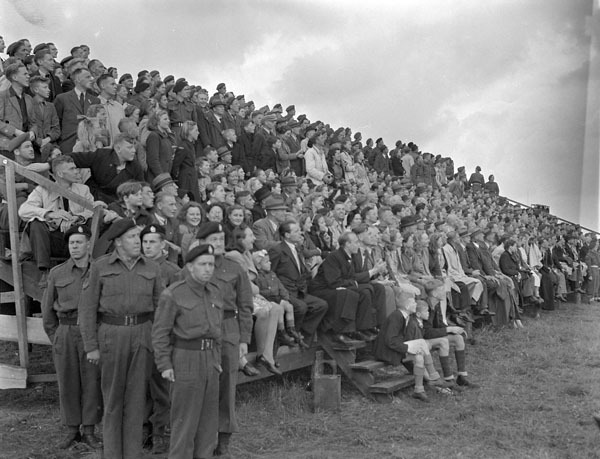 Saw Helen Bright, Shorty Erswell and Neil, then started for Tilburg where we visited my old billet, and then drove home later in the evening. Tomorrow evening we start back to Germany. I wonder what my orders will be when I again reach Army H.Q. 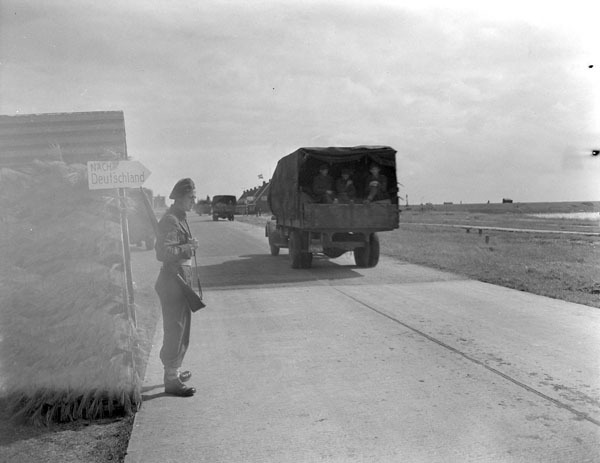 German prisoners-of-war preparing to return to Germany, Harlingen, Netherlands, 25 May 1945. LAC. 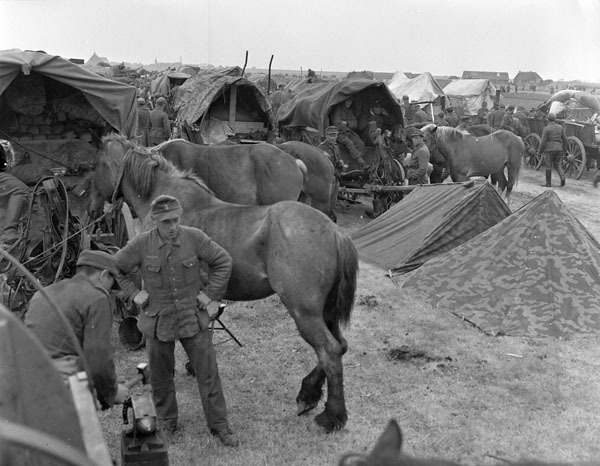 Gunners of the 12th Field Regiment, Royal Canadian Artillery (R.C.A. 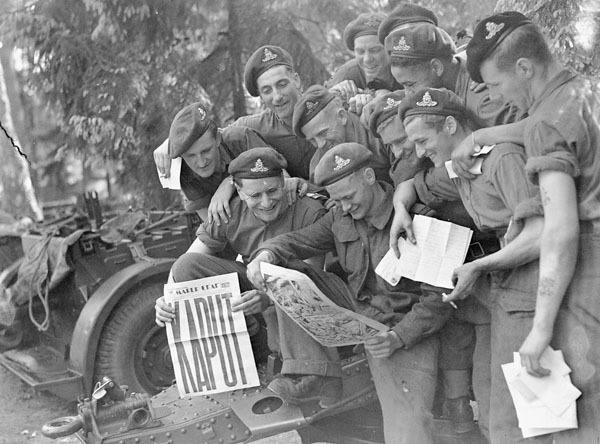 ), with the Victory issue of the Maple Leaf newspaper, Aurich, Germany, 20 May 1945. LAC. any where, still looking for Hans but he has not arrived yet. Hans arrived during the evening. May 19 — Usual day. Mac and I drove up to Oldenburg with Archy Moran to 2 M.A.C. for the evening. Some evening. 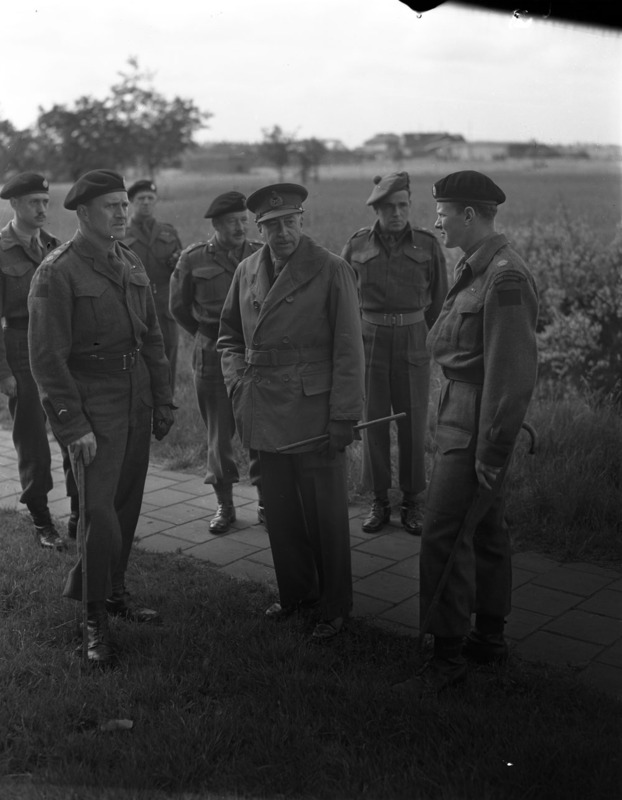 General Crerar visits the LDSH, 19 May, 1945. LAC. Ordered this morning to open an Infectious Wing and we are joined today by the Exhaustion Unit. We certainly have some sized unit now. Today three boys from the 2nd Light Field Ambulance from Italy dropped in for a visit. They were in my section and are spending a few days with us. 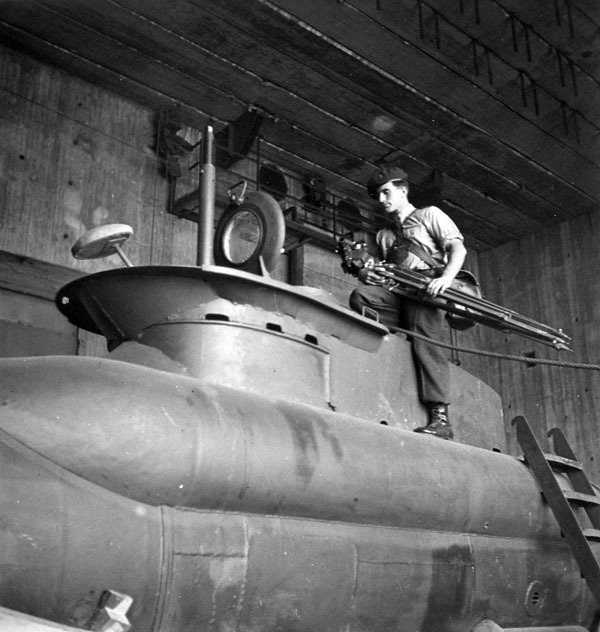 Sergeant A.H. Calder of the Canadian Army Film and Photo Unit, who carries a camera and tripod, examining one of the German miniature two-man submarines discovered in a shipyard at Kiel, Germany, 18 May 1945. LAC. 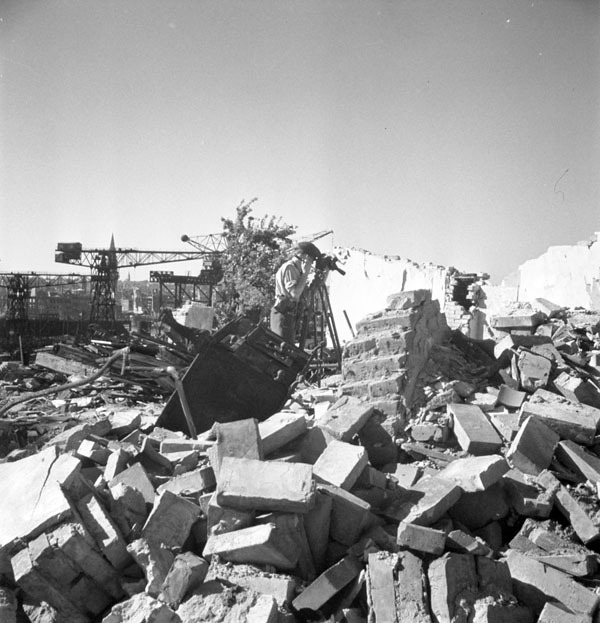 Sergeant A.H. Calder of the Canadian Army Film and Photo Unit filming the bomb-damaged Krupp shipyard at Kiel, Germany, 18 May 1945. LAC. 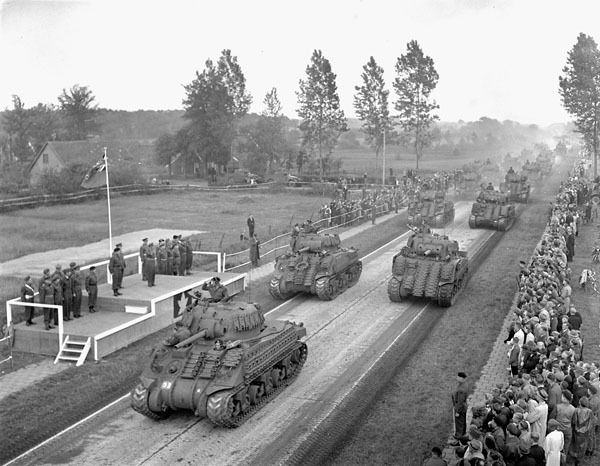 May 17 — Gordie, Pat Coulter, Stover and Smith and I drove up through Oldenburg to Wilhelmshaven and the submarine fleet which had surrendered. We then drove back to Oldenburg and out to Bremen. 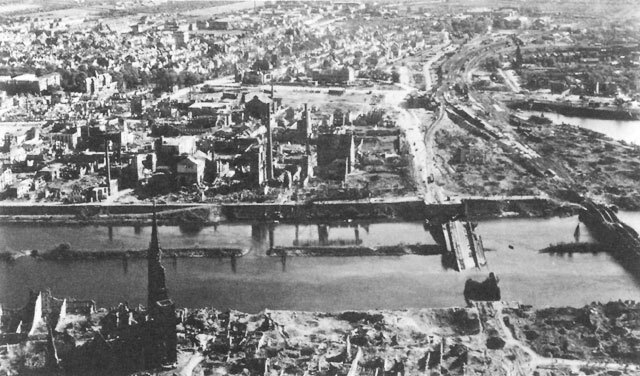 Bremen had taken a terrible pounding, but is peculiar. Walls are standing but the buildings are gutted.